For hours on end, carefully and tirelessly, in extreme weathers and unpredictable traffic- Drivers maneuver to help the wheel of economy rolling. It’s our duty to recognize and appreciate them. 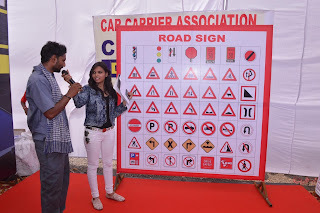 On the occasion of Driver’s Day, Mahindra Truck and Bus Division partnered with Car Carrier Association to conduct driver training program on 15th September. This noble event was held in 6 locations - Gurgaon, Manesar, Pune, Nashik, Sriperumbdur and Dabaspet. 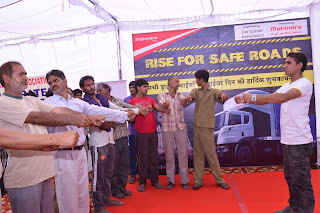 ‘Rise for safe road’ was the apt theme of the event and it just did that. The event inspired, motivated and felicitated the Drivers. Mahindra Truck and Bus Division’s field team representative began the event with high spirited welcome note which was well received by drivers and representatives. Following this, activities like Yoga lessons, Health Check-up, Eye Check-up, Awareness skit, Driver Felicitation and Safety Kit distribution were conducted. Mahindra Truck and Bus Division’s super trucks like Truxo 25, Traco 35, Traco 40, Truxo 31 were displayed in each of the six locations. · Drivers from Car Carrier Association and automobile OEMs. · Representatives from Mahindra Truck and Bus Division’s area office field, service teams and dealership teams were present. · Representatives from key Car Carrier application fleet Owners like Mercurio Pallia, TCI, R SAI, IVC, Janta Roadways, Supreme Auto Carriers, Cargo Wings etc. · Representatives from OEMs like Honda, Hyundai, Renault Nissan and Toyata were present. The event was a success with an amazing response of 1900 participants. This training program played a vital role in bringing the stakeholders closer.